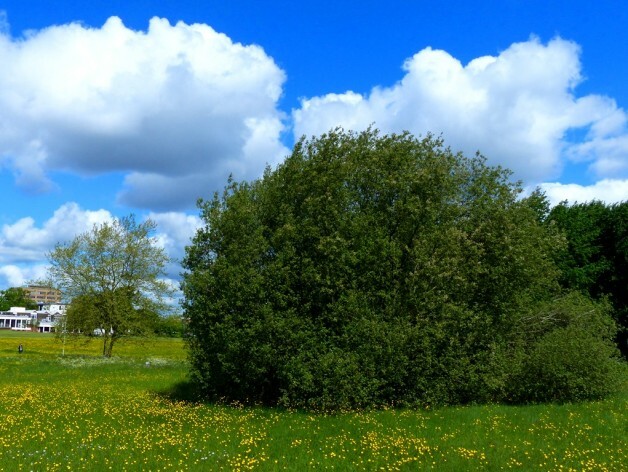 The Willow family – Salicaceae – includes two main genera – Willows and the Poplars – a family of deciduous trees and shrubs with (usually) simple, alternate leaves with stipules. The flowers are in catkins and there is no perianth (i.e. no obvious petals or sepals). There are 2 carpels and the fruit is a one-celled capsule which bursts to release the many silky plumed seeds (this is that cotton wool fluff you find strewn all around at willow time!). Willows: Salix species, have lanceolate to oval leaves and the catkins are erect with a single outer scale enclosing the bud. Nectar glands are present and pollination is by insects. 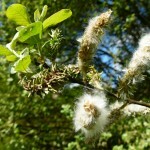 Poplars: Populus species, have broad triangular, cordate or rounded leaves, the catkins are pendulous and hanging with several toothed outer scales to the bud, the flowers are cup-like with many red stamens but there is no nectar (the genus is wind pollinated so no need to waste energy making nectar!). 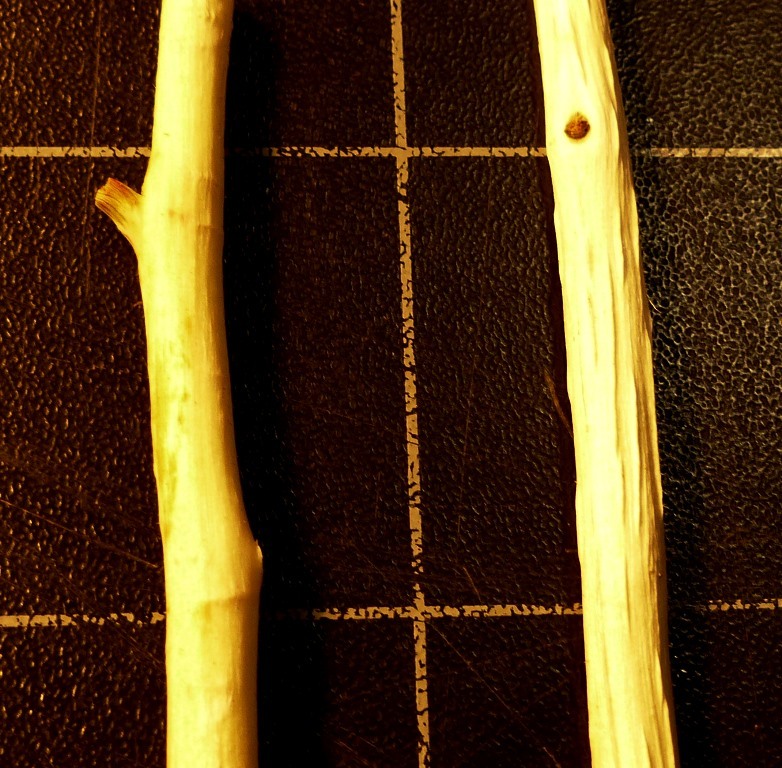 Here we focus on two species of Willow. There are plenty to choose from, with many species and sub-species in Britain, also the genus is seriously promiscuous and hybridisation is rampant! This gives rise to great variability between different plants which may be true species, sub-species, varieties, clear hybrids or anything in between! Consequently, the genus has a reputation for being “difficult”, and on the whole a fairly well deserved reputation! But then, where would eXtreme botany be without a challenge or two! Confident identification requires both floral and vegetative characters, but identification to a reasonable level can be achieved with just vegetative material as show in the veg key (though this doesn’t cover the hybrids!). Vegetative ID requires mature leaves (best collected in July-September) from second year twigs (don’t use the youngest twigs at the tip of the branch but those one section back) and don’t use the suckers, which may be shooting up from the ground around the main tree, as the leaves on suckering shoots can be quite atypical. 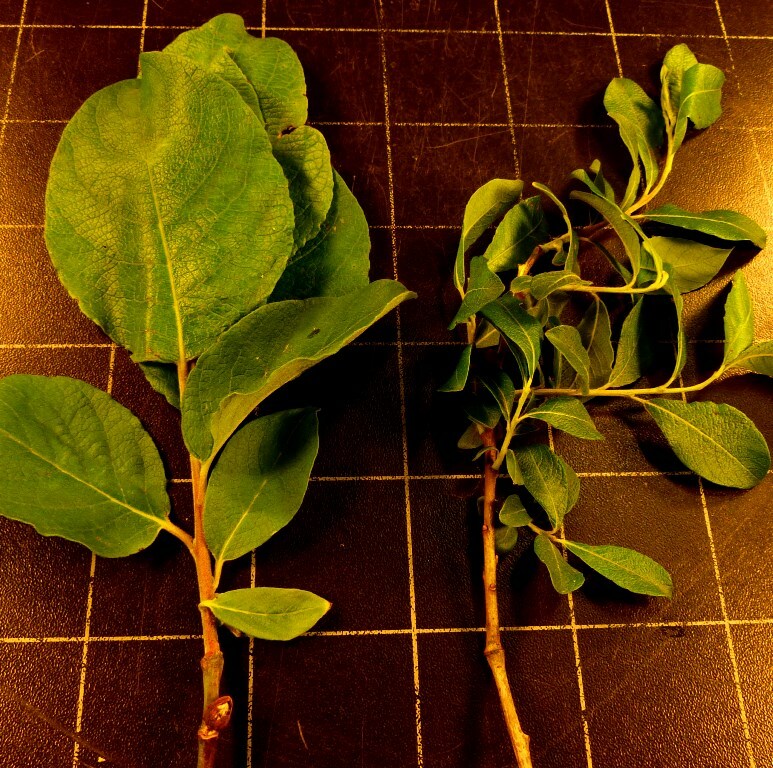 So, our two common species are the Goat Willow (Salix caprea left image) and the Grey Willow (Salix cinerea, right image). 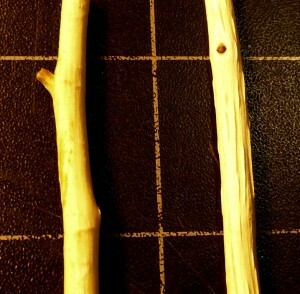 The veg key conveniently separates willows into two main groups based on leaf shape: one group having leaves more than 3 times as long as wide (more linear), and another group with leaves less than three times as long as wide (more oval). Our two species both fall into his latter camp; i.e. leaves oval-ish. 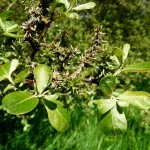 However, there are significant differences, Goat Willow has leaves broadly ovate to sub-orbicular (less than 1.5 times as long as wide and rather like apple tree leaves) and the buds tend to spread on the twigs and are yellow or reddish and soon becoming hairless. Stipules are 8-12 mm long and auricle-like and more or less cordate at the base, soon falling – willow aficionados call this “caducous” (Dr M loves this word!). Grey willow has leaves usually obovate to oblanceolate (2-3 times as long as wide) with the buds adpressed to the twig and yellow or red and rusty hairy. Stipules usually small and auricle-like often persistent (so not or less caducous!). So in truth two willows with leaves less than 3 times as long as wide, but in many other ways very different and not too difficult to separate based on mature leaves (at least not until you come across hybrids of course, which abound, but that’s another story!). BUT, what if there are no leaves, or if it is very early in the season, and the leaves have not fully developed? Well, don’t panic! There is a nice little trick which Dr M was taught by a friendly arboriculturalist. You take a second year twig and strip away the bark to expose the wood below and in Goat willow this is as smooth as the proverbial babes bottom, while in Grey willow it is striped with raised ridges or “striae” (another super willow word!). It’s a delightful little trick of the eXtreme botanists trade and one that is sure to raise a smile of botanical appreciation when first viewed! Dr M recommends using the veg key to get you started, but always check your idents with the excellent BSBI guide to willows and poplars. This little yellow book is well worth purchasing and you should check the second hand book stores and online, in case of bargains! Beautifully illustrated and informative, it’s a real botanical gem and an essential addition to the eXtreme botanists library book shelves! 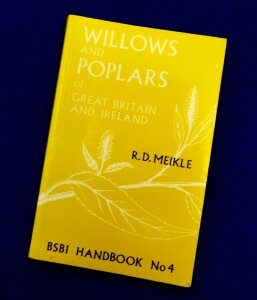 So keep your eXtreme botanical eyes open for willows on your walks and rambles and give them a go!